I was reminded of this quote from Charlotte Mason as I sat quietly on a bench overlooking thousands of evergreen trees covering a layer of foothills. No children grabbed at my feet, no phone buzzed in my hand; just a Bible pouring out wisdom on my lap. It struck me that this quiet time is growing time, even for an adult. With all of the distractions that come with the day, quiet time, whether it is spent in devotions or just quiet reflection, is so hard to come by. Pencil marks fill in almost every white space in our calendars; noise fills in almost every corner in our homes; clutter fills in our shelves; and social media fills in whatever space is left. While the world wants us to fill in all of the spaces with “preschool” and to proudly wear our badges of busyness, following Charlotte Mason during our children’s early years gives them room to grow. This quiet growing time that Charlotte Mason described should be spent playing outside, observing, working on habits, and building relationships. Instead of starting lessons, filling out worksheets, or putting children in dozens of “enrichment classes”, this quiet time trusts that a child learns from observing, enjoying, and building relationships. To society, it seems like delaying formal lessons means to delay learning. But if you’ve ever experienced this beautiful season, you know that isn’t true. We’re giving children the space to learn and to think on their own. After my reflections in the mountains, I realize that “quiet” is crucial to this growing time. In the quiet, my children can truly pay attention to the little ladybugs as they creep up the blade of grass. Without the constant noise of screens, they can think about the character in the story, and why he acted the way he did. Sitting in silence, they can meditate on a Bible verse that they’re memorizing. Related: Early Academics: To Wait or Not to Wait? These quiet moments bring growth. Now contrast that to the child whose only chance for quiet reflection is in the time-out chair. Those angsty moments don’t bring on many life-changing reflections, sadly. The over pressure of school and life causes children to have unbelievable amounts of stress. The earlier the academic pressure begins, the younger children are when they experience this sad form of stress. Organizations are scrambling to combat this “extraordinary pressure, educational and social.” Now, programs exist to teach children to manage large amounts of stress through meditation. Instead of fixing the symptoms, we can help by not piling the stress onto our children in the first place. This quiet growing time in a Charlotte Mason preschool offers a brief six years of life without stress and pressure. What a beautiful gift to give our children. There are people today who can’t stand the silence. They do whatever they can to ease this discomfort- they tap their pens on the table, hum a tune, or turn the TV on the second they get home. They often keep themselves extremely busy so that they don’t run the risk of being home in the quiet. I know that people are different and have different reasons for doing this, but I think that by establishing peaceful habits in the early years, my children will grow up without the desire for constant distractions. Several of Charlotte Mason’s habits that she mentioned demand silence- either while acquiring them or using them in daily life. 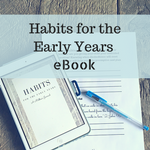 Since habits are so important during the early years, the very nature of a quiet growing time supports the development of the habits I mentioned above. After the retreat ended, I expected to feel that deflated feeling that comes from being so uplifted, and then returning to daily life. Instead, I pursued the same quiet that I had in the mountains. I stopped checking my phone every hour. The computer remained turned off until it was time to write. I intentionally planned quiet times, not just for myself, but for my children. And that peace followed me down the mountain. We don’t have to be slaves to these hectic times. We can pursue peace and quiet, and maybe the quiet growing time will apply to us our entire lives. I view this wonderful season, this quiet growing time, as a beautiful preparation for their future: a future that will undoubtedly become busier and more complicated. Well-said and such timely advice! It’s so tempting to get caught up in planning for my five & three year old sons; the best plans should involve lots of nature and intentional quiet! It is very tempting! Sometimes I see others’ high expectations or cute learning ideas and wonder if I should be doing more. But it’s amazing how much my little ones learn from playing and being outside!